WOKING player of the season John Goddard has joined League One club Swindon Town after two years at Kingfield. 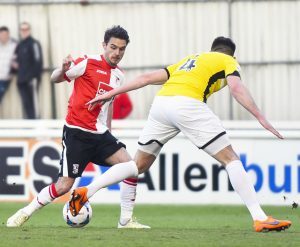 An undisclosed fee has exchanged hands between the Robins and the Cards for the England C international – who was on the scoresheet for the 20th time in the 2015/16 season in his last ever Woking appearance (a 2-1 win over Eastleigh) on the final day of the campaign. Sources close to the club believe the figure to be in the region £70,000, with the 22-year-old talent opting for the County Ground – a two-division leap from The National League – amid rumoured interest from Championship clubs. That figure could rise under the terms of the transfer, which will also see the Wiltshire club come to Surrey for a pre-season friendly in July. Former Reading academy graduate Goddard – currently enjoying a deserved holiday – took to social media to send his gratitude to his old club. He said: “I look forward to the next step in my career but will not forget the help and support you have given me.